I love samphire but it’s got to be native as I have found the stuff from Israel is invariably woody and disappointing. A trip to my fishmonger reaped great rewards as he had some delicious snapper on show, but if you’re not as lucky you can swap for any firm white fish fillets. Just be aware that anything thicker than 2cm will need slightly longer cooking. If you didn’t want to get the frying pan out you can cook the fish in the oven for its whole cooking time, adding at least two to three minutes. Bring a saucepan of water to the boil and blanch the samphire for one minute. 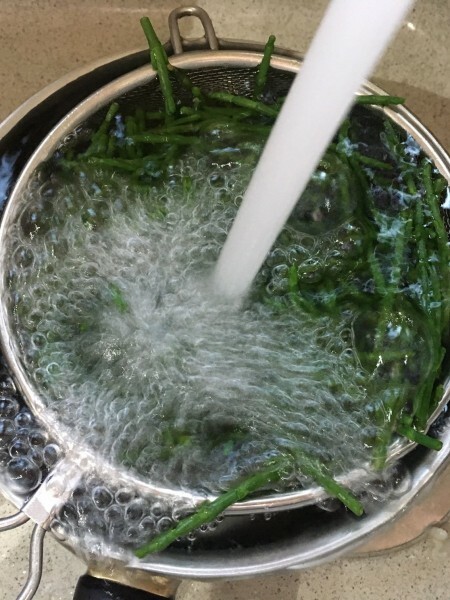 Drain and refresh the samphire under cold water. Drain again and pat dry. 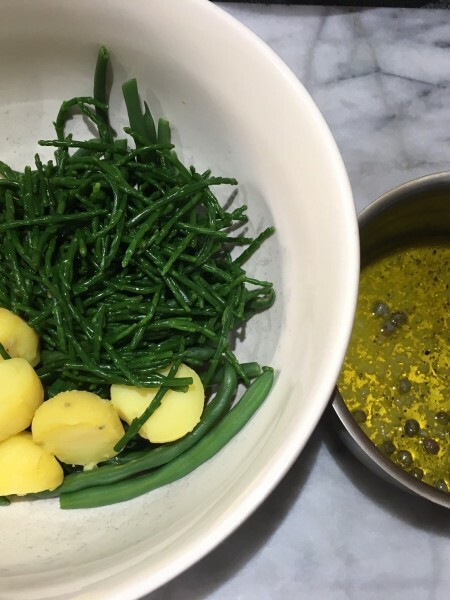 Put the samphire in a mixing bowl. Cook the beans in boiling water for 3 minutes until just tender. Drain, refresh under cold water and drain again. Pat dry and add to the samphire. Put the potatoes in salted water and bring to the boil. Cook for about 15-20 minutes until tender. Drain and leave to cool. When the potatoes are cold peel off the skins and slice. Add to the bowl of vegetables. Toss together and season with a little salt and ground black pepper. Transfer to a serving plate. 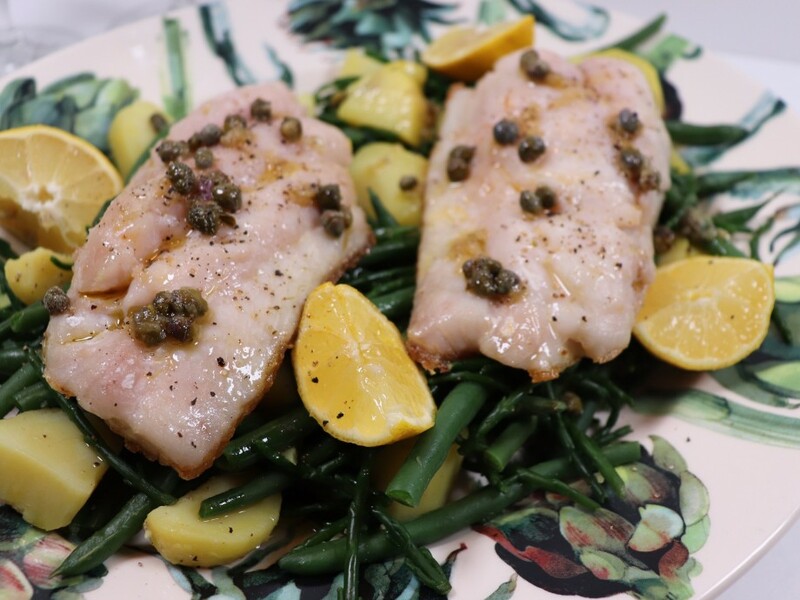 For the dressing, put the lemon juice, garlic, capers and 4 tablespoons of the oil in a small saucepan. You can warm it through while the fish is finishing its cooking time in the oven. Heat the oven to 210˚c, fan oven 190˚c, mark 7. Heat an ovenproof frying pan and add the remaining tablespoon of oil. 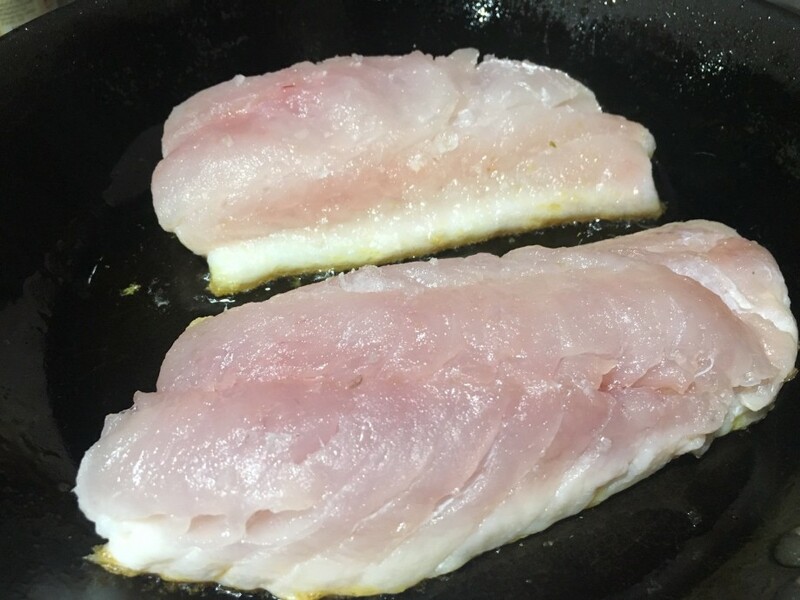 Season the fish fillets with salt and place in the frying pan, skin-side down. Fry over a moderate heat for about 6 minutes, or until the uppermost flesh is almost opaque. Transfer to the oven and bake for a further 5-6 minutes until the flesh feels firm and starts to flake when gently prodded. While the fish is in the oven start to warm the dressing through over a low heat. To finish, place the fish on top of the salad and spoon over the warm dressing. Serve with wedges of lemon.